As an official AMD™ Workstation System Integrator/WSI we're proud to introduce our new X4, the cutting-edge AMD FirePro™ Ultra Workstation by XI-MACHINES. Featuring up to four high-end AMD FirePro™ W8100 or W9100 Graphics Accelerators the X4 can now master even the most demanding computing tasks from CAD, Engineering Analysis and Digital Prototyping to 3D animation and effects creation as well as video editing and post-production. In addition to the powerful Dual-CPU setup (with up to 44 cores/88 threads) the X4 also offers maximum GPU performance for all your computing tasks (CAD/CAE, CAM, Engineering, DCC, Rendering, Science, Simulation etc.) and realtime applications. 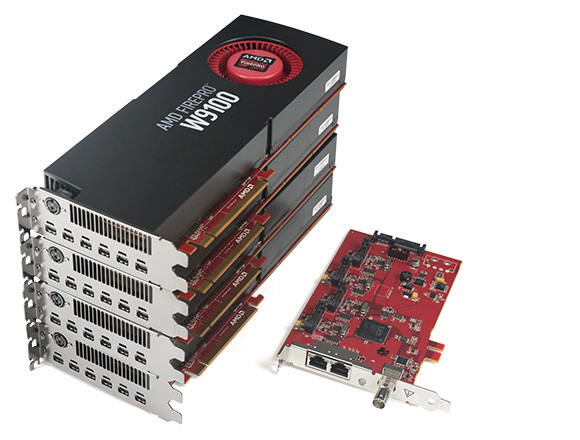 With up to four high-end AMD FirePro™ W9100 graphics processing units (GPUs) and support for OpenCL™ 2.0, creative and engineering professionals can now master even the most demanding, GPU intensive workflows with an outstanding performance. Combined with an industry-first 16GB GDDR5 of dedicated graphics memory and 2816 Stream Processors per GPU, the AMD FirePro™ Ultra Workstation is a Visual Supercomputer for your desk. Optionally available: S400 sync module for real-time presentations, video walls or demanding applications that require synchronization to external sources (Genlock) or multiple GPUs (framelock). Install up to 3 additional PCIe cards (RAID controllers, sync module, video boards, professional audio interfaces, additional network cards...) even in a fully equipped X4 quad with four W9100 GPUS (limited length). e.g. Finite Element Analysis, physics simulation, CFD (computational fluid dynamics) for aerospace, automotive, industrial design, Medical etc. the setups depicted above can be achieved with a single W9100 (up to six displays per GPU - our X4 QUAD can handle up to 24 4K displays), the W8100 can handle up 4 displays per GPU. Depending on the setup and display equipment, additional active Displayport adapters maybe required. Upon purchase of a X4 workstation you can qualify for up to 50% cash-back rebate for your first AMD FirePro™ card. XI-MACHINES is official AMD WSI (Workstation System Integrator) and partner for this cash-back rebate. This special applies to XI-MACHINES X4 models with AMD FirePro™ W8100 or W9100 as well as seperately purchased qualified products of the AMD FirePro™-family. The following terms and restrictions apply. Please read the AMD Terms & Conditions in its entirety before making a purchase. XI-MACHINES does not give any warranties or takes liability for your claims regarding this cash-back promotion. The pre-approval of this promotion is open to end-customer companies, partnerships and sole proprietorships located in the United States (incl. the District of Columbia), Canada (excluding Quebec), France, Germany, and the United Kingdom. Step 2: Once approval has been given you purchase a XI-MACHINES X4 or another qualified product. Step 3: After approval and purchase you have to fill the rebate claim form before or on 15th of October 2014 to to claim your promotional cash back. Questions regarding this cash-back promotion? We are happy to assist you.